These gentle, protective products are specially formulated by Dr. Amy to prevent common newborn skin ailments and protect your baby’s skin from the elements. Bottom Balm was developed to create a protective barrier between a baby’s bottom and wet and dirty diapers. Our gentle, lightweight formula is chemical-free and doesn’t leave a residue, but will help to protect babies from redness and irritation and can be used with each diaper change. Hydrating Ointment is wonderfully soothing and will help to seal in moisture and protect skin from the elements. While Hydrating Ointment was developed for dry or sensitive skin, it can be used with any skin type and can be used daily as often as wanted. 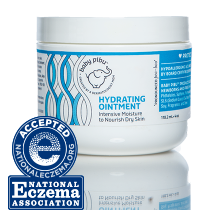 Hydrating Ointment has achieved the National Eczema Association’s Seal of Acceptance. Baby Pibu’s Baby Sunscreen SPF 30+ is hypoallergenic and chemical-free and was created for daily use. It is not greasy and is stain resistant, while protecting babies’ delicate skin from the harmful rays of the sun. Our formula has achieved the Skin Cancer Foundation’s Seal of Approval for Daily Use. Baby Sunscreen can be used on babies six months of age or older.